Stanley Porter’s new introduction to Paul is intended as an updated and reworked version of his Early Christianity and Its Sacred Literature (written with Lee Martin McDonald, Hendrickson, 2000). Porter argues for many traditional views in this book, such as Pauline authorship of all thirteen letters of Paul and the unity of the letters. He rejects pseudonymity as an explanation for the Prison and Pastoral epistles. Since the book is intended for use in the classroom, Porter presents alternative views as well. In addition, he more or less rejects the New Perspective on Paul, offering some sharp criticisms of Sanders and Dunn especially in his discussion of the Law (111-121). Porter has one or two ideas in the book which he considers “new territory” in Pauline studies, such as his belief Paul had seen and heard Jesus during his earthly ministry or that Paul himself was the major force behind collecting his letters. The first part of this book includes six chapters dealing with Paul’s life and letters. There are more issues which could be included in this section, but for the most part these are issues Porter has already written on in the past. Each chapter in this section concludes with a bibliography divided into basic and advanced categories. In his first chapter, Porter describes “Paul the person” (including appearance, upbringing and education, relationship with Rome, occupation, etc.) Porter evaluates what is usually said about Paul’s background and concludes his associate with Gamaliel is highly likely, although he did not progress far in the Greco-Roman educational system. With respect to citizenship. Porter agrees with Bruce Rapske that it is plausible Paul was a citizen of Rome and a devout Jew at the same time. There are two problems with this view. First, Paul never refers to his citizenship in his letters and second, Roman citizens would have been required to participate in the imperial cult. Porter points out that Roman citizenship did not require participation in Emperor Worship until the second century and Jews may have been given some level of autonomy which allowed them to avoid this practice. He includes a short section on Paul’s conversion. Although Paul’s experience is similar to a prophetic call, the term conversion is “entirely appropriate to describe what happened to Paul” (31, contra the New Perspective). The consensus view is this prefers to the Damascus Road experience, but Porter calls this “sheer assumption” (35). Since the context concerns the other apostles (who had seen Jesus during his lifetime and after the resurrection), it is possible Paul also refers to seeing Jesus in the same way. He also points out Paul refers to “Jesus our Lord” rather than his more typical “Christ Jesus.” Porter admits each of his points are “slender threads,” but he concludes it is at least plausible Paul heard Jesus teach (38). For the details of this argument, see Porter’s monograph When Paul Met Jesus: How an Idea Got Lost in History (Cambridge, 2016). The final issue Porter treats in this chapter is the value of the book of Acts for understanding Paul. The traditional view that Luke was a physician who was a close friend and traveling companion of Paul after Acts 16 has been challenged. There are in fact many chronological details in the letters of Paul which are not reflected in the book of Acts (Paul’s relationship with the Corinthians, for example). He presents five common arguments against the idea the writer of Acts knew Paul and provides an answer for each, concluding that the book of Acts “can be used to reconstruct a fairly coherent chronology of Paul’s life” (44). The writer of Acts was not a disciple of Paul, but he does reinforce the picture of Paul drawn from the letters. In Chapter 2 Porter develops a Pauline chronology using the letters and the book of Acts. For the most part Porter’s chronology of Paul’s life and ministry is more or less traditional, with the exception of his dating of Galatians for the earliest letter of Paul, prior to the conference in Acts 15. He offers a six-point outline of Paul’s career beginning with his conversion in A.D. 33 and ending with his re-imprisonment in 64-65 and execution as late as 67. He places the letters into this outline, several times if there is significant debate over the date (Galatians, for example). This chapter also includes the evidence for several of Paul’s imprisonments, including Ephesus (not mentioned in Acts) and Corinth (“this view has very little to commend it,” 67). Other than a dismissive footnote, Porter does not interact with the recent contribution by Douglas Campbell’s Framing Paul (Eerdmans 2015). Chapter 3 discusses potential backgrounds to Paul’s thought. He divides the evidence into two sections, Greco-Roman or Jewish. Porter surveys Paul’s Greco-Roman influence beginning with his use of Greek and epistolary style as well as his contact with the larger Hellenistic world. With respect to his Jewish background, Porter discusses Paul’s interpretation of Scripture (clearly more Jewish than Greek). He includes teaching in synagogues in this section, although this method of ministry is not mentioned in the letters. As Porter points out, this may be in part a result of Paul’s short time doing synagogue ministry in each city, and the fact it often ended in disaster (92). Porter offers a short survey of Pauline theology in Chapter 4. He divide the material into two categories. First, there are a number of fundamental beliefs Paul clearly holds but does not argue. For example, Paul believes in God, although he does not argue for his existence nor is there a sustained theological statement in the letters on what he believes about God. Porter includes Jesus as messiah as well as Jesus as divine in this category as well. A second category is “developed beliefs.” These are theological beliefs which are developed at greater length than the fundamental beliefs and are consequently the subject of more scholarly debate. For example, Porter includes justification and Paul’s view of the Law under this heading and spends significant space discussing the challenge of the New Perspective on Paul on these two important issues. There are short sections on reconciliation, sanctification, salvation, the triumph of God the gospel, the church, and Jesus’s death and resurrection. Although there are some eschatological ideas in the section on God’s triumph and the resurrection, contemporary interest in Paul’s view of the future should result in a more robust section on Paul as an apocalyptic thinker. Some of this material does appear in the section on 1 Thessalonians, although remarkably there is very little on 2 Thessalonians 2. Chapter 5 deals with Paul as a letter writer, a topic which has become very popular in recent years. Porter therefore briefly comments on the purposes of the letters and the use of amanuenses, but the main section of the chapter is a short introduction to the form of ancient Greek letters as applied to Paul’s epistles. There are similarities, but also important differences. For example, Paul makes use of paraenesis, “concentrated groups of admonishments regarding Christian behavior” (149), although it is difficult to distinguish how these sections relate to the bod of the letters. Chapter 6 includes two related topics concerning authorship and the Pauline canon. Porter has written on the topic of pseudonymity in other contexts and concludes rather strongly that pseudonymity was not as commonly accepted in the ancient world as is sometimes claimed, and less so among Christian literature. There are examples of “noble lies” in which a writer attempts to deceive their readers by creating a new letter in the voice of an authority such as Paul, but as Porter points out, even a noble lie is still a lie. In this section he interacts with Bart Ehrman (Forgeries and Counterforgeries, Oxford 2013), concluding that his criteria are “highly subjective and ultimately indecisive” (166). For Porter, the real problem with pseudonymity in the New Testament is the implication of deception both in terms of the author and the audience. For example, if 1 Timothy was not written by Paul to Timothy, then the whole situation of the letter is a deception. Therefore Porter finds it more plausible to accept all thirteen letters as coming from Paul. The second part of this chapter is likely to be more controversial. Rarely does an introduction to Paul’s letters treat the formation of the Pauline canon in any detail. The standard way of explaining the Pauline collection is a slow evolution of the canon over the 150 years since Paul’s death, perhaps with the final collection occurring after a period of lapsed interest in Paul. On the other hand, there are several competing theories concerning an individual who collected the letters, such as Timothy or a “Pauline school.” For Porter, these suggestions are on the right track, but who better than Paul to select the letters to be collected and circulated in his name? Porter supports his assertion by pointing to the common literary practice of retaining a copy of a letter after it was sent. In this view, Paul retained “official” copies of all this letters, from which he selected some for inclusion in a Pauline corpus. This might account for why some letters such as the Corinthian Correspondence are missing. They have been lost during Paul’s travels, or simply not included by Paul’s own decision (although Porter does not suggest this, the “severe letter” to Corinth could have been omitted by Paul since it was no longer relevant after he was reconciled with the church). Porter has worked out an interesting scenario, although it is built largely on assumptions and silence. The second part of the book consists of six chapters of introductory material for the Pauline letters in chronological order (Galatians, 1-2 Thessalonians, 1-2 Corinthians, Romans, the Prison Epistles, and the Pastoral Epistles). Each chapter covers any unique background issues unique to the letter, then Porter summarizes the contents. For example, the north vs. south Galatia theories, the order to 1-2 Thessalonians, the unity of Romans, etc. Each chapter concludes with a basic bibliography divided into commentaries and monographs. Conclusion. In the introduction to the book, Porter expresses his initial hope that this book would serve as an up-to-date replacement for F. F. Bruce’s Paul: Apostle of the Heart Set Free, although by the time he finished his book it ended up different than Bruce (xi). To a large extent, Porter’s Paul the Apostle is a worthy successor to Bruce’s classic book on Paul. Although he provides a tenacious defense of many traditional views (such as authorship, continuity with Acts), Porter does not simply repeat standard arguments typically found in Pauline introductions. His presentation of alternative views makes this an ideal textbook for a seminary class on Paul’s letters. But the book is written in a clear style which will make in accessible to pastors, teachers or anyone interested in the “state of Pauline studies” today. In the last two years IVP published the first two volumes of newly discovered commentaries by the late nineteenth century scholar J. B. Lightfoot. In the forward to that volume Ben Witherington recounted how he discovered hand-written manuscripts several long-forgotten commentaries J. B. Lightfoot in the spring of 2013. With this commentary on 2 Corinthians and 1 Peter all of manuscripts discovered by Witherington have been published. Compared to the other two volumes in this series, the commentaries on 2 Corinthians or 2 Peter are brief and fragmentary, 2 Corinthians runs about seventy pages and 1 Peter has a twenty page introduction with a mere nineteen pages of commentary with the notes breaking off in 1 Peter 3. Many of the comments on 2 Corinthians are simply textual notes with only a word or two of comment. Chapter 9, for example is about a half-page of text. Since the commentary is less than 100 pages, the editors have included several additional essays by Lightfoot to round out the volume. As an introduction to 2 Corinthians commentary Lightfoot wrote a “Pauline Prolegomena” on the chronology and context of the letter. The essay interacts with a German text on Pauline chronology by Wieseler published in 1848, although these pages take the form of notes on Wieseler’s work. Following the 1 Peter commentary are several appendices. The first is an essay on the mission of Titus in 2 Corinthians originally published in The Journal of Sacred and Classical Philology (1885). This essay was originally collected in Biblical Essays (1904, reprinted by Baker, 1979). The second appendix is a reprint or some lectures notes on “St. Paul’s Preparation for Ministry” (1863), also reprinted in Biblical Essays. Appendix three is a sermon preached in 1877 on 2 Corinthians 3:6 entitled “The Letter Killeth but the Spirit Giveth Life.” The sermon was preached at St Paul’s in Cambridge and collected in an 1893 volume. The fourth appendix reprints “Lessons of History from the Cradle of Christianity.” Witherington had discovered this essay among Lightfoot’s papers, although a later edited version was published in the Durham University Journal in the 1980s. This manuscript was handwritten timed essay, eventually edited and published (and subsequently reprinted in the Durham University Journal in 1987). Appendix five reprints “The Christian Ministry.” This 90 page essay first appear in Lightfoot’s commentary on Philippians. As Witherington comments in his note, editing this lengthy essay was the last scholarly work undertaken by B. F. Wescott, longtime mentor and friend of Lightfoot. This edition includes several pages of notes from Lightfoot not included in my copy of his Philippians commentary (Zondervan reprint, 1973). Appendices six and seven essays evaluating the contribution of Lightfoot published in a 1992 Durham University Journal celebrating the centenary of Lightfoot’s death. First, C. K. Barrett’s considers Lightfoot as biblical commentator and James Dunn offers an essay looking back at the influence of Lightfoot, especially his commitment to historical inquiry. Initially this took the form of responding to D. F. Strauss. Lightfoot calls Strauss a “mythicizer” who dismisses the search for historical truth in the biblical records as hopeless. Lightfoot strenuously disagreed and sought to study early Christian with historical rigor, believing there is nothing to fear from the “full light of science and criticism” (cited by Dunn, 307). I find this a less-than-common attitude among conservative biblical scholars more than 100 years after Lightfoot. Conclusion. When I reviewed the previous volumes in this series, I asked why a modern reader care about a lost commentary written by a scholar who died in 1889? That IVP Academic would be interested in reprinting the notes for commentaries never completed by a scholar who died more than a hundred years ago is a testimony of the influence Lightfoot had on scholarship. That Ben Witherington and Todd Still would devote effort to organize the volumes is a significant testimony to Lightfoot’s long shadow over contemporary biblical studies, even if that influence is not always recognized. My main criticism of this volume is that these are not newly discovered commentaries, but brief notes which Lightfoot may have later used to write a commentary. The bulk of this book are reprinted essays by Lightfoot and two celebrating his legacy. This does not limit the value of the three volumes of this series published by IVP Academic. The series is a fitting tribute to an important scholar and will serve as worthy introduction of Lightfoot to many younger students of the Bible and early Christianity. According to the introduction, in 392 Jerome wrote his commentary on Nahum, the first of his commentaries on the twelve Minor Prophets. In the next year he finished commentaries Micah, Zephaniah, Haggai and Habakkuk, Jonah and Obadiah were completed in 396 following the Originist Controversy. In the mid-390s a petition circulated to have Origen declared a heretic. Although he translated Origen’s work and was an advocate of his work, Jerome signed this petition and became an outspoken opponent of Origen. Scheck says this can be seen by “occasional outbursts” against origin in the commentaries beginning with Jonah. Nevertheless, Jerome possessed Origen’s twenty-five book commentary on the Minor Prophets “which I hug and guard with such joy, that I deem myself to have the wealth of Croesus” (xxii). The commentaries are presented in the order Jerome wrote them and a table in the introduction identifies the year he completed each commentary (xvi) and a second table includes order of the commentaries along with Jerome’s other commentaries and his translations of Origen. 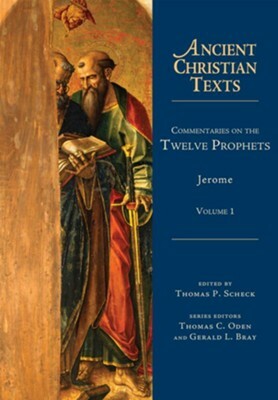 In preparing these commentaries, Jerome used the text of the Hebrew Bible as his main source, but also the LXX and Origin’s commentaries on the Minor Prophets. The translations were originally made by classics students from Ave Maria University under the direction of Thomas Scheck. The original translators are identified at the head of each commentary. Scheck carefully edited these translations into the final form found in this volume. A key feature of Jerome’s commentaries is his frequent allusion to both the Old and New Testament. These are identified in the notes and virtually every pages of this volume has at least several allusions to biblical texts. As Scheck suggests, Jerome understood as a unity and thought the best commentary on Scripture is Scripture itself (xxiv). Following Jerome’s translation of the Hebrew Bible he usually gives the Septuagint, commenting on any differences. For example, commenting on Zephaniah 2:3-4, Jerome translates the Hebrew “Seek the Lord, all you meek of the earth, you who have worked his judgment, seek the just seek the meek,” and the LXX as “seek the Lord, all the humble of the earth, work judgment and seek justice.” The LXX reading is interpreted as a reference to “no one else by Christ” because everyone who seeks him will find him, citing Matthew 7:8. This is typical of the commentaries, they are thoroughly Christocentric. An important feature of this volume is the indices. The first collects references in the text (and footnotes) to historical allusions (the Ebionites, Origen, etc.) or to other translations (Symmachus and Theodotion, for example). There are about ten pages ion the Scripture including allusions to Sirach. Aside from historical interests, what is the value of reading a 1600 year old commentary on the Minor Prophets? There are a number of allegorical interpretations which attempt to focus a text on Christ or the church which seem to go well beyond the results of a grammatical historical method. For example, commenting on Haggai 2:19-20, Jerome take the pomegranate as a reference to the church. In order to make this point, he alludes to the Song of Solomon 8:1, the bride’s cheeks are compared to a pomegranate and the bride in the Song is allegorical interpreted as the Church. The olive tree in Haggai 2:20 refers to the illumination of Scripture, presumably because olive oil was used in lamps. Modern interpreters would be content to (correctly) read Haggai 2:19-20 as a reference to prosperity returning to the land (when pomegranates and olive trees will flourish again). This may be an extreme example, but Jerome’s method of reading a given text alongside other texts is a kind of Christological intertextuality which flattens the canon and often creates observations which would be ignored by the traditional grammatical historical method. Perhaps there is good reason to draw two or three texts together as Jerome does, but sometimes the interpretations are strained beyond what my modern mind can bear. Nevertheless, IVP Academic is to be applauded for once again providing these commentaries to English readers. Like other volumes in the series, the book itself is well-designed and reader friendly. In Romans 14 Paul is trying to guide congregations to preserve the unity of the body of Christ despite having a wide variety of views on some practices. He mentions two in particular, considering some days sacred and eating some types of foods. Esteeming one day over another may refer to when the Roman congregations chose to gather. The natural assumption is Jewish Christian congregations continued to worship on the Sabbath. Primarily Gentile congregations met whenever they could, apparently settling on Sunday, the day Jesus rose from the dead. Eating and abstaining may refer to Jewish food taboos. Again, when a primarily Jewish congregation shared a meal, the food would have been purchased and prepared with attention to cleanliness (i.e., not meat sacrificed to idols, nothing forbidden in Leviticus), etc. Primarily Gentile congregations may not have adopted Jewish food laws, accepting all foods as clean after one gives things for the Lord for the food. However, it is likely some Gentiles did choose to avoid food sacrificed to idols. What matters for Paul is living one’s life “for the Lord” and not for ourselves. This means the one who is in Christ (a living sacrifice, one who is living in a way that promotes unity in the body of Christ), ought to voluntarily set aside preferences in deference to others. Voluntarily setting something aside is the key to understanding the principle Paul wants to establish here. Like Jesus, who set aside certain rights he had as a member of the Godhead in order to become human (Phil 2:5-6), so to the member of the body of Christ in the present age must set aside their privileges the may legitimately be owed in order to preserve the unity of the Body of Christ. Paul is not discussion sinful practices, but what are often called preferences. He is not talking about Gentiles visiting a prostitute (as he is in 1 Corinthians 6), since that is a practice incompatible with being a living sacrifice, holy and acceptable to God. This is the nature of the strong/weak in this passage: the person with weak faith considers eating food to be a mark of spirituality and therefore breaking those convictions would be a sin. Does this only work one direction? A person who does not eat unclean food cannot “give up” their preferences and eat unclean food to make a Gentile feel comfortable? For example, if a person today is a vegetarian, can they “give up their conviction” and share meat with someone who eats meat? If I were to share a meal with a Seventh-Day Adventist, for example, I would have no problem eating any food they served. But they may have a serious problem eating something I serve. If I have a meal in an Israeli hotel, it is far easier for me to eat kosher than to insist on my rights and have the kitchen make me a bacon-wrapped cheeseburger. It is far easier for the meat-eater to give up their conviction and eat only vegetables. This is certainly true on a physical level. But more importantly, with respect to convictions, the meat-eater is not violating a principle of their faith, but the vegetarian would be “sinning” with respect to their own world view. There is a clear application of this principle for the modern church. First, I think there are some easy examples: If a member of congregation prefers one style of music for worship, they ought to be able to set that preference aside in order to reach people for Jesus Christ. But I can imagine other situations which would make some Christians more uncomfortable. Could a pastor drink a beer with someone in order to not make a beer drinking member of their congregation comfortable? What about a pastor trying to reach a person in the south who is offered a wad of chewing tobacco. Could they accept the offer without violating their conscience? It is critically important to observe Paul is talking about practices which are not important for salvation in the present age nor is he talking about sinful practices (even if the weaker brother thinks they might be). As I said in the previous post, both the weak and the strong are believers, and both are welcome in Christian worship and fellowship. For Paul, these are not matters to divide churches or break fellowship over. What are some problems you have encountered trying to find the right balance between preferences in local congregations? Who are the Weak and Strong in Romans 14? Although it is possible Paul includes this section as a general commentary on how Jews and Gentiles ought to get along in mixed congregations, it is likely he has heard something about a specific conflict in the house churches in Rome. He describes some of the believers as weak and others as strong and admonishes the strong to not pass judgment on the weak. After surveying several options, Cranfield concludes the weak are those who desire to continue to observe the ceremonial law of the Old Testament. If this is the case, it is a similar situation to the Gentiles in Galatia who are being encouraged to fully convert to Judaism in order to follow Jesus. It is possible this weak/strong discussion is an extension of the “meat sacrificed to idols” problem in 1 Corinthians, as suggested by Mark Reasoner. If so, then the weak might be the Jew, and the strong the Gentile. This suggestion has some merit since Paul wrote Romans from Corinth after the period of conflict had come to a close (after 2 Corinthians). It is possible his experience with the Corinthian believers colors his comments to the Romans who may be struggling with similar issues. Jewett draws attention to a brief exchanged in Horace in which one character does not wish to speak on the Sabbath because he is “a small man of weakness, one of many” (Jewett, Romans, 834; Horace Sat. 1.9.67–72). Reasoner used this line to argue “the person excessively observant in a foreign religion who matched the ‘weak’ caricature was known to Horace’s audience.” (Reasoner, 54). Regardless of the practices of the weak, their faith is sufficient for Paul to consider them to be Christians. He does not tell the Roman congregations to expel them from the church like the young man in 1 Corinthians 5, nor does he admonish them like he the wealthy in 1 Corinthians 11:17-22. Both the weak and the strong are Christians and equally a part of the Christian community. Both are equally welcome at a communal meal where the Lord’s Table is being celebrated. This issue has important ramifications for Christian fellowship in the present church. Churches often draw lines where they should not, or fail to draw lines when they should. Are there people who are often excluded from fellowship because of some practice (or non-practice)? Bibliography: Mark Reasoner, The Strong and the Weak: Romans 14:1-15:13 in Context (SNTSMS 103; Cambridge: Cambridge University Press, 1999).